The Darkest Shadow® of Them All The Shadow® Phantom has got to be the most unique Shadow we’ve ever made. It’s an utterly stunning head-turner, and one look will tell you why—with a blacked-out 745 cc V-twin engine and black rims sporting matte silver highlights, bobbed fenders, spoke wheels and beefy front fork. Then the exhaust note hits you: a deep, throaty pulse rumbling from dual exhausts. It’s hard to resist, we know. And downright impossible once you’ve seen its price tag. And best of all, the Shadow Phantom gets an estimated 56 miles per gallon! Sometimes a whisper is way louder than a shout. And that’s most definitely the case with the Shadow Phantom. Sleek new pipes feature bullet-style mufflers for that classic cruiser style of yesteryear. Large-diameter head pipes and the 2-into-2 system design combine to put out true, V-twin cruiser sound. The Phantom features sleek bobber-inspired styling with extensive blacked-out and matte finishes. If there's one place you DON'T want retro performance, it's when it comes to your brakes. That's why we gave the Shadow Phantom a 296mm front disc for distinctly modern stopping power. Our sleek, one-piece gunfighter-type seat is comfortable and looks great too. Skimming the pavement at just 25.7 inches, the Phantom's low seat height makes flat-footing it at stoplights or in parking lots a breeze. And the Phantom's narrow seat/tank junction makes it feel even lower. Forget about fiddling with a choke—the Shadow's fuel injection system means no-hassle start-ups on cold mornings or at high altitudes, and optimal performance in any condition. 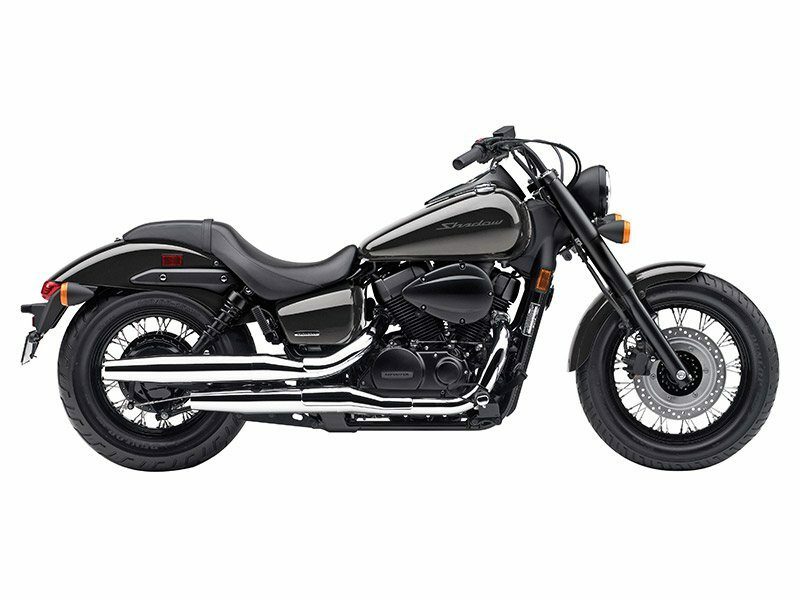 A minimalist front fender gives the Shadow Phantom a lighter, cleaner, more progressive look. Nothing pumps out the torque like a big V-Twin. The Phantom's power makes it perfect for around-town cruising, commutes and casual weekend-long rides.